Alright friends! Over the past few years I have revealed many many projects on our current home and our previous home. I thought it would be nice to have page where I can show you a down & dirty look at all the before and afters I’ve done through the years! I’ll be adding to this page as new projects are completed and gathering more up from the archives! 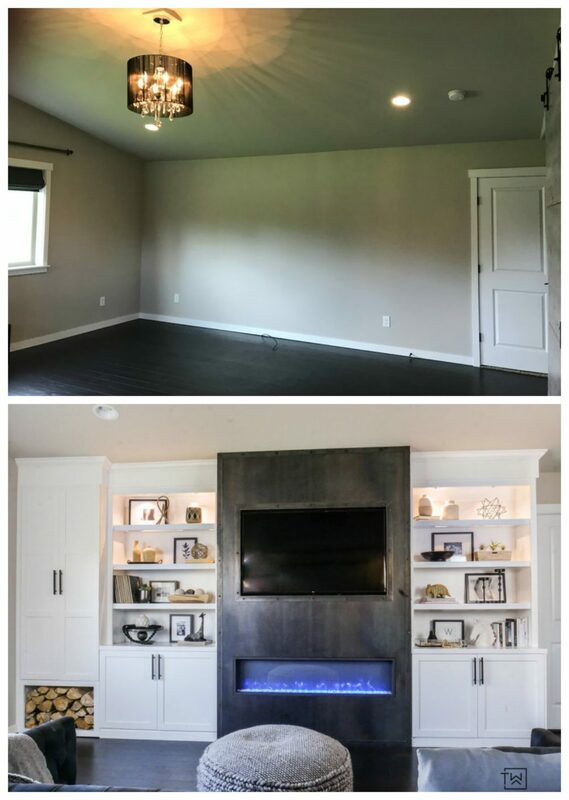 If you would like to learn more details about each space and see more photos, click the links below to take you to the reveal post. 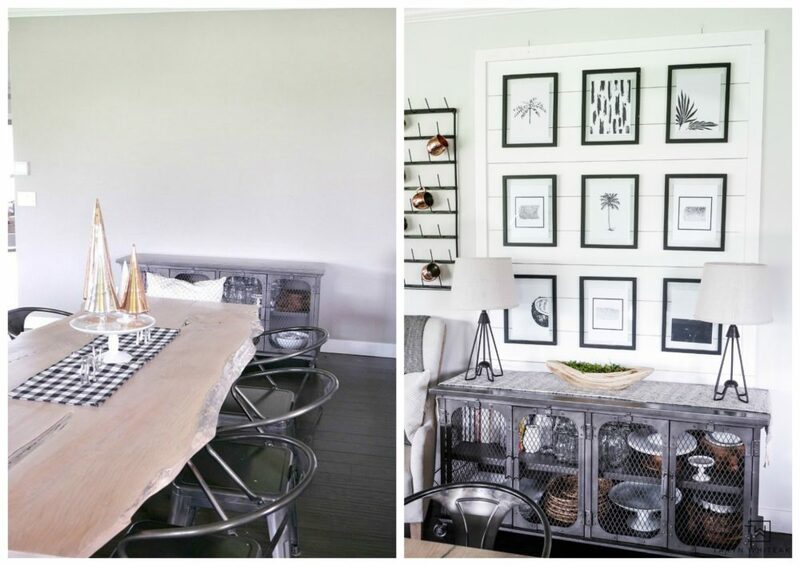 It’s so fun to see how much a space can change with minimal to big ideas! When we moved into our home our master bedroom was one HUGE open space! It was such a great space to work with but completely unused. I knew our bedroom had the potential to be a luxurious retreat for my husband and I and we went for it! I designed this massive built-in area to take up that huge blank wall. We put in a raw steel fireplace and designed the custom built-ins to be both decorative and functional. You can read the full post here. The opposite side of the room has a similar story. I wanted to take advantage of the vaulted ceilings and make this space more luxurious. We ripped out the carpet and had hardwoods installed and added a canopy bed for heigh, beautiful accent wall and cozy couch. I still have more work to do in this space but it’s come a long ways! Click to see the latest bedroom post! 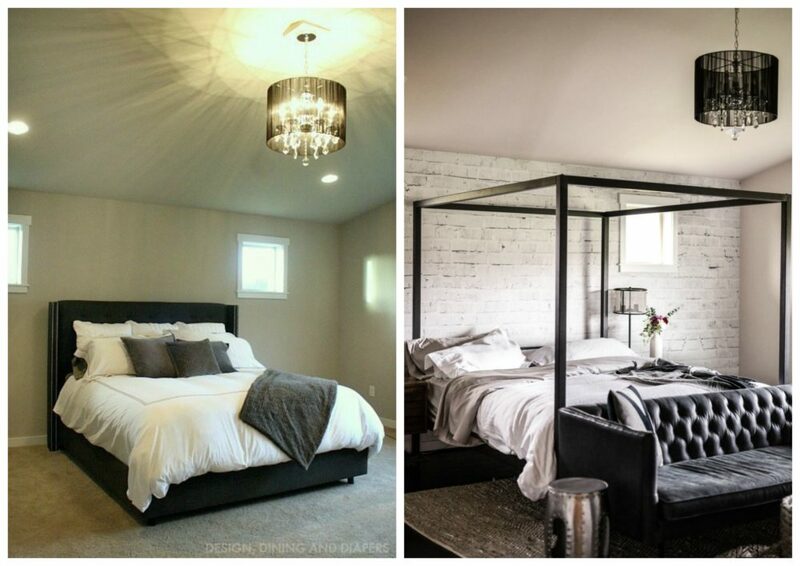 While we are on the topic of bedrooms, here is our master bedroom transformation from our previous home! This was done about 5 years ago and I still love the texture it adds to the space. You can see the full master bedroom makeover here! 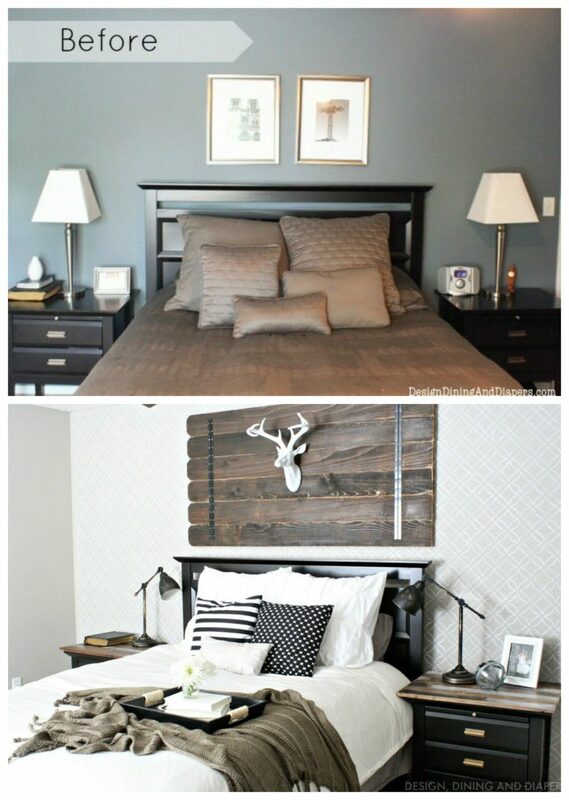 And sometimes a room isn’t necessarily awful, but it needs a new purpose! 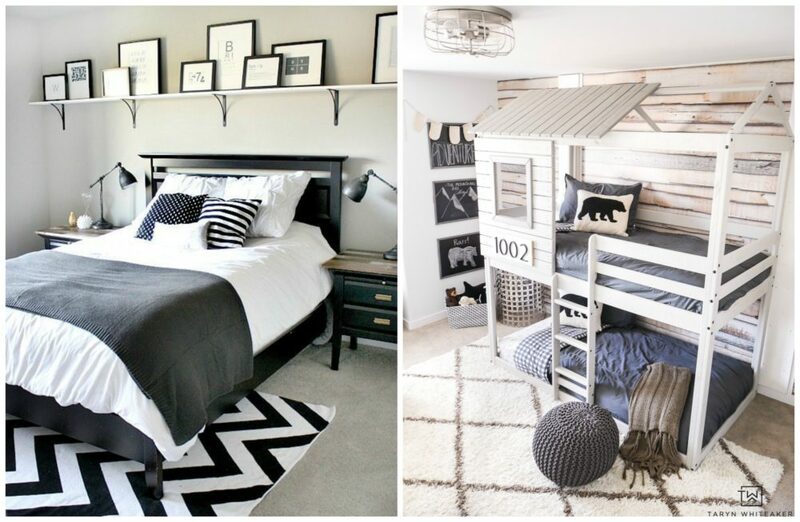 Here we transformed our guest room into a room for our youngest! It’s amazing how different a space can look! Get the full Boys Bunk Room Tour Here. 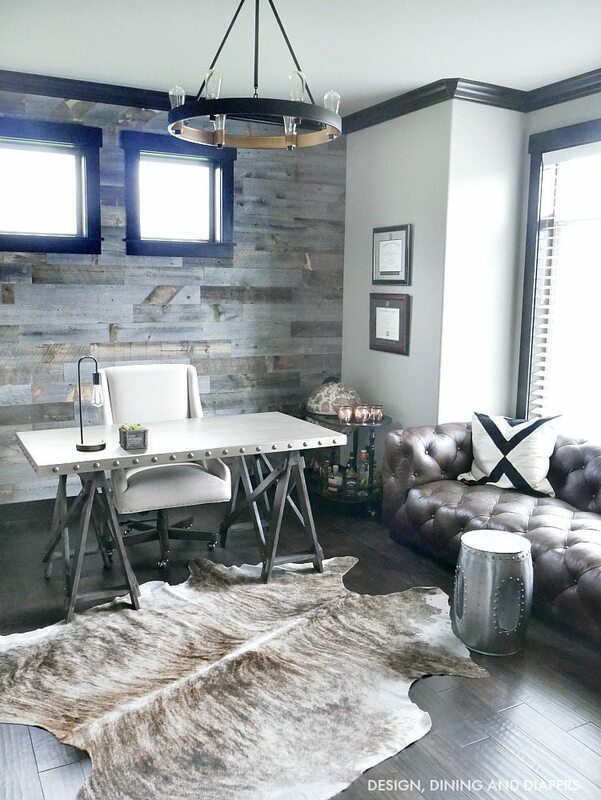 I completely transformed this space by installed a Stikwood wall, industrial furniture and decor and giving it a classic masculine industrial look. 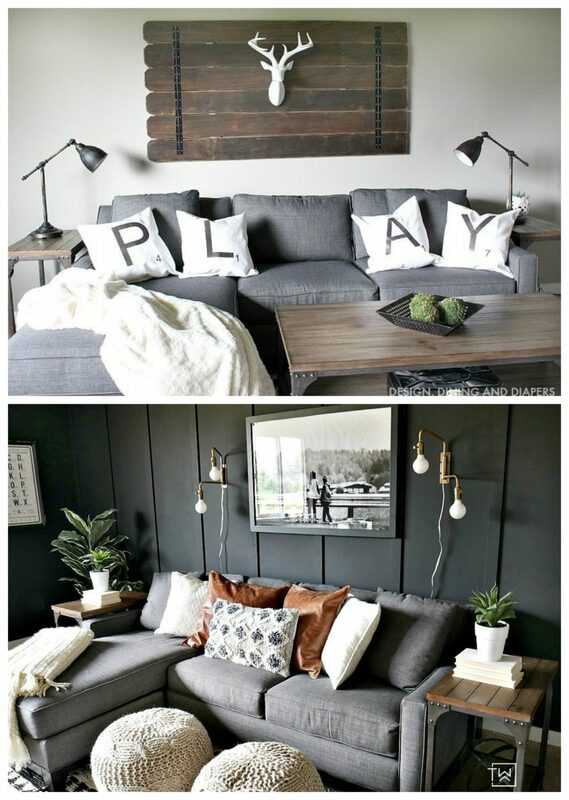 I still absolutely love this space and you can take a full tour of it here! Our kids share a jack-n-jill bathroom. The original bathroom design was nice but had very basic builder grade finishes. It just didn’t match the rest of the house! I kept the original flooring since was still in great shape, had the vanity painted in a Charcoal Blue, installed new quartz countertops and sinks and then I installed a unique hexagon tile accent wall. Click here to see the full bathroom tour! This is our guest bathroom upstairs! It was a little too contemporary for my taste and I thought I’d give it a fun quick makeover. 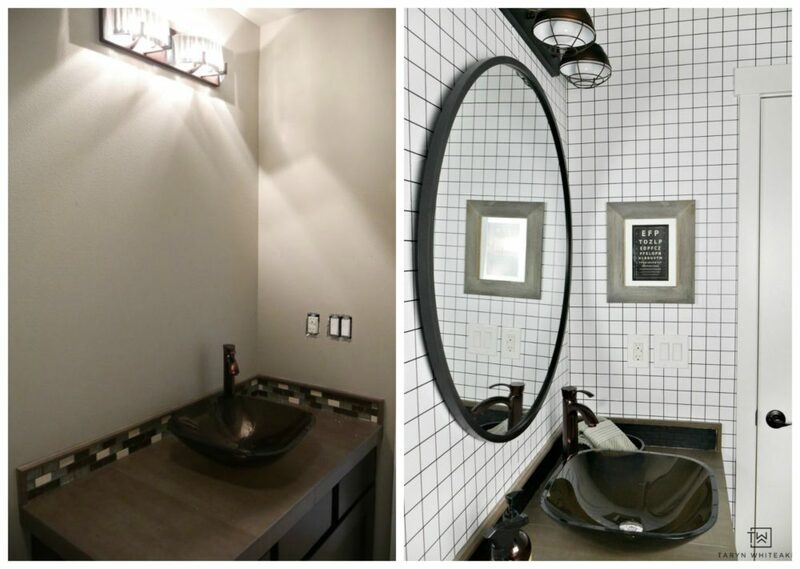 For this project I had to keep the vanity and most of the original fixtures but gave it a bold look with geometric wall paper and some industrial decor updates. I’d still like to do a bigger remodel on this bathroom but this was a nice cosmetic fix to give it a little more character! 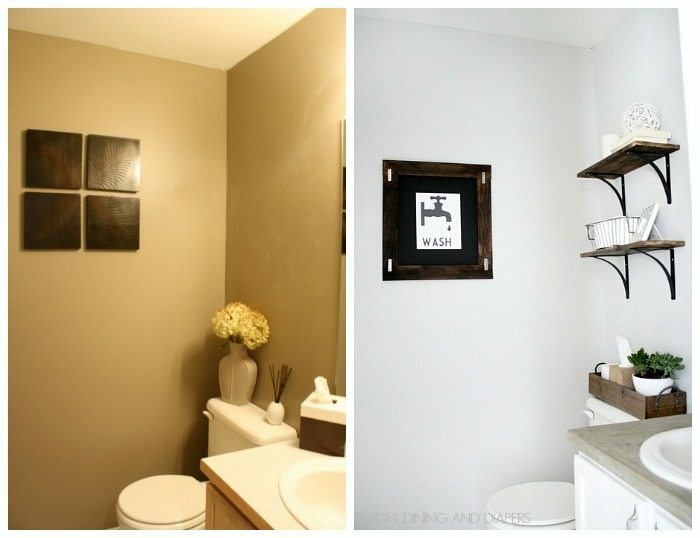 Click to see the bull tour of this bathroom! Here is a little throwback to our first home! 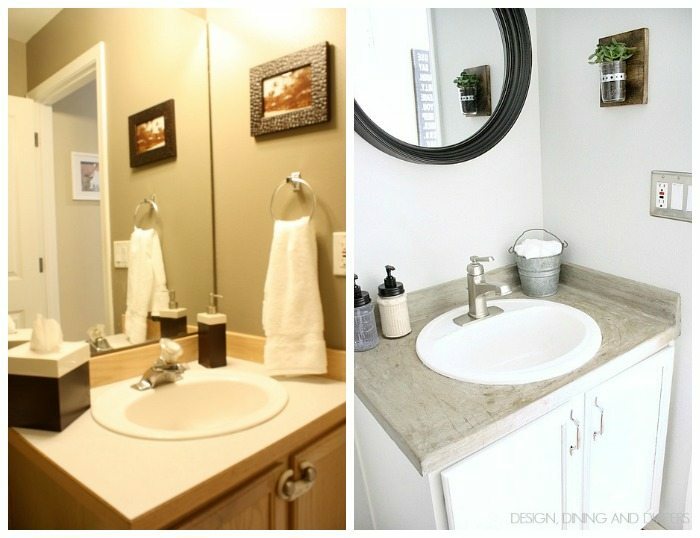 This was a very simple bathroom makeover that made a huge difference. 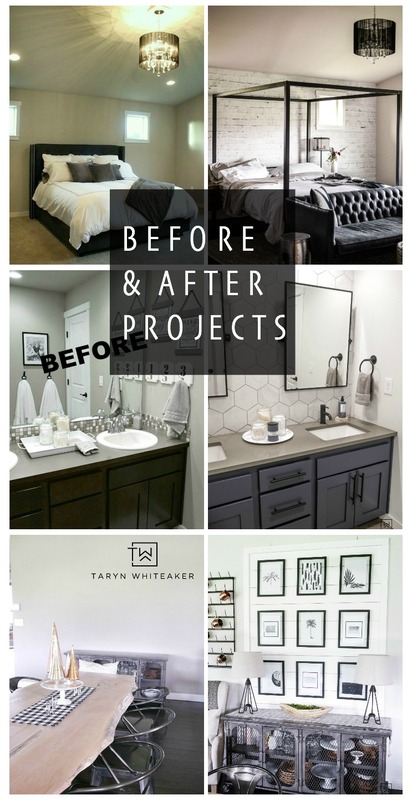 This makeover was all about cosmetic updates, I painted the vanity, added a concrete countertop, painted the entire space and added new fixtures. The budget was minimal but the impact was big! 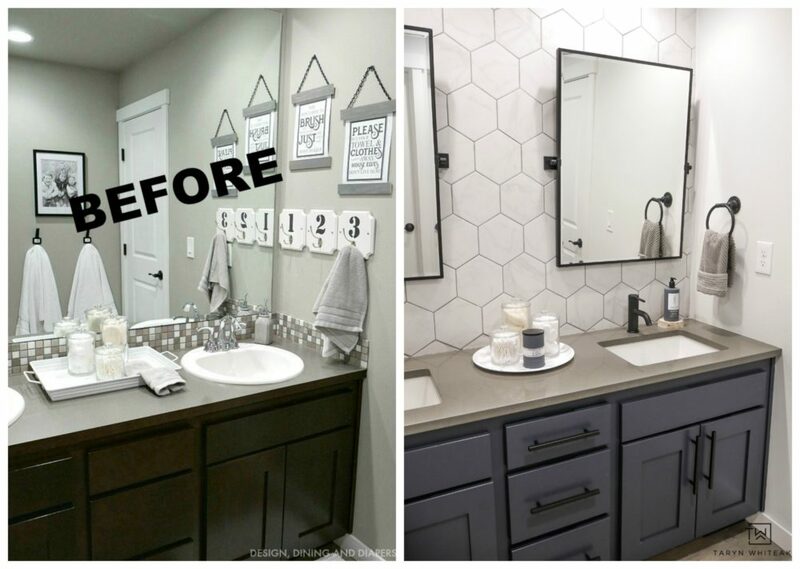 Take a full tour of this modern farmhouse style bathroom makeover! We are fortunate to have a large bonus/movie room in our home. It serves as a place to store all the toys and messes but it’s also a cozy place for movie nights and just to hang out! The above photo was the first attempt at decorating this space. Over time my style has shifted a bit as I have grown as a designer and I wanted to go bold in here and do something that was dark and moody and supper cozy! What I love most about this transformation is that it is literally almost done completely through paint! 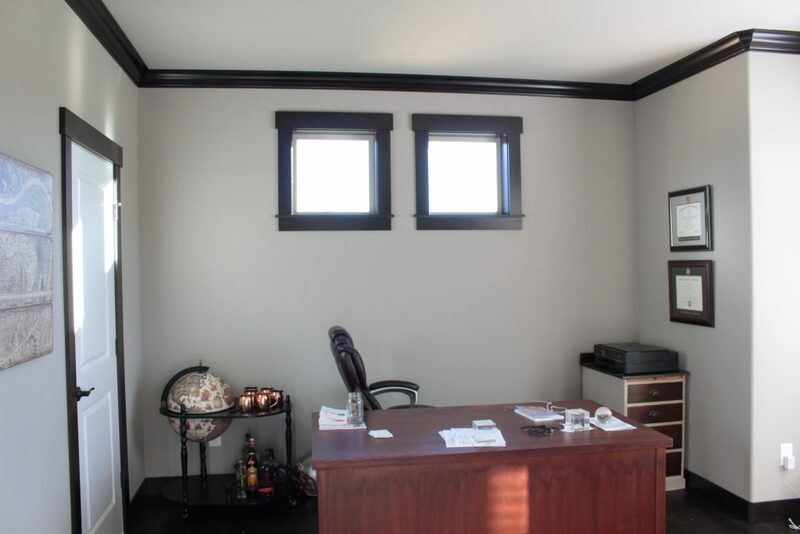 Just darker walls with a little bit of trim and switching out a little bit of decor. You can see more of the reveal post here. 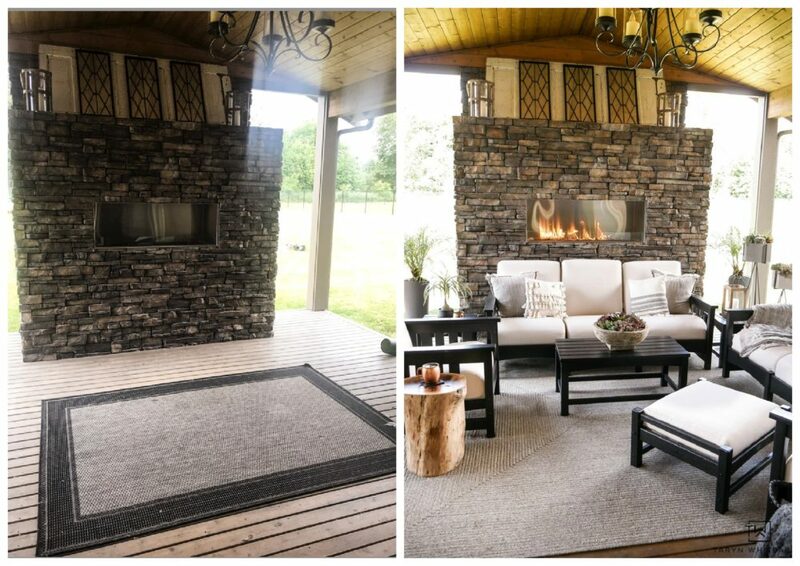 We wanted to take advantage of this great outdoor living space and create a cozy place to hang out with friend and have family nights. Date nights are great out here too! So I designed this space to be fully functional with lots of seating, rustic accents and lots of texture! It’s fun dressing this place up for all the holidays. See the full reveal here. We desperately needed a space to organize all the shoes and backpacks for our kids! So I created this mini drop station in our garage. All shoes and backpacks get put away and my sanity is saved. I wish it looked this clean all the time, but baby steps! Get all the info here. In our kitchen area we had this huge blank wall that was very awkward. I didn’t know what to do with the space especially since we have taller ceilings downstairs. I wanted to take advantage of the focal point so I created a shiplap display area that I can use for parties or to display gallery walls throughout the year! It really finished this space off nicely! You can get the full tutorial here. 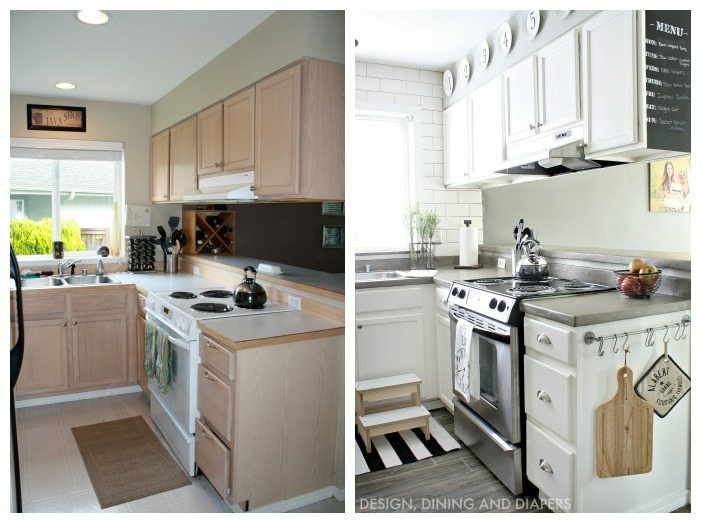 Updating our kitchen in our previous home was one of the very first massive DIY projects I tackled! This makeover was done about 5 years ago and it will forever hold a special place in my heart as it started to pave my way into really finding my personal style. We had a very basic builder grade kitchen that desperately needed to be made over! 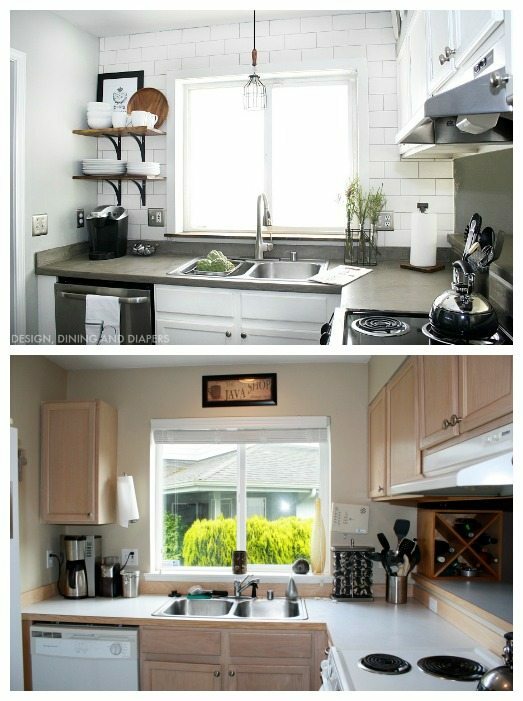 With pretty minimal cosmetic changes I was able to completely transform the look of this kitchen! While this may be a smaller project, it made a big difference! 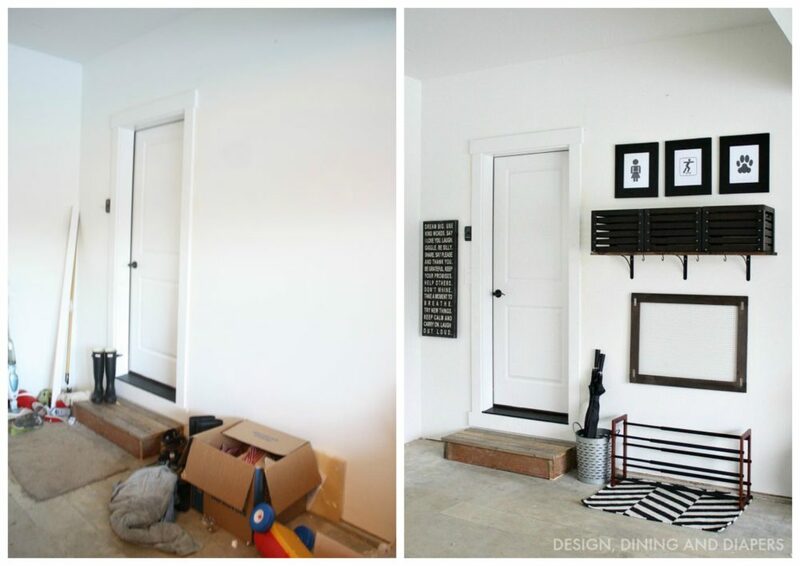 By simply adding some awesome DIY Piping Shelves this space went from super boring to full of character! 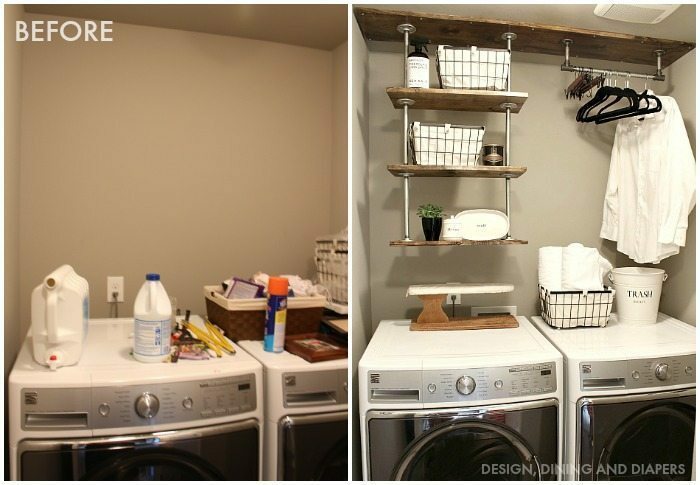 See the full laundry room space here. YOU CAN ALSO VIEW OUR FULL HOME TOUR HERE!